As of June 2017, Common World Inc. will no longer be selling or supporting FirstClass. Starting July 2017, our service contracts will not support FirstClass Servers or any FirstClass Solution. We will be pushing new communication software and solutions for our clients and customers that best fit their needs. We have already started writing plans and roadmaps for our current RA Customers that will replace FirstClass with other software and services. For the first few years after the iPhone was released, one of the main topics that was brought up in meetings with our clients was the use of mobile devices. Smart phones have made their way into the hands of all levels of staff. The iPad is replacing laptops. Along with talking about the use of these devices, we have also been very busy training staff on etiquette and best practices. Some of our organizations have been struggling to keep up with best practices and proper use of these devices. The culture of your staff and tech will change quickly once a new device has been introduced. Naturally, users' technological abilities will be enhanced with the introduction. It has been a very exciting and daunting task for Common World inc. and our customers to keep up with these changes and needs. Much of our time has been invested in this. Mobile connectivity is rapidly advancing every quarter. New devices are introduced every month. Mobile apps are released and updated daily. It has been very difficult for schools to keep up with and support all of these new options. Right now, tons of crazy-awesome devices are being released. Every couple of months there is another, better device released. The smart phone is the ultimate accessory to have right now. It's easy to get caught up in the hype when trying to find the best solution. It's also easy for the tech department to spend hours trying to get the latest phone to work in their environment. Often, I'm asked to recommend the best device for my clients. This is a tricky question because this depends on the staff needs and the quality of the device's connectivity. I recommend to start with the mobile carrier (not with the device). Find out which one has the best reception in your buildings, and test surrounding areas that the staff live in and will travel to. Once the best carrier is found, then choose the mobile device(s) to implement. If possible, make sure to get test units. 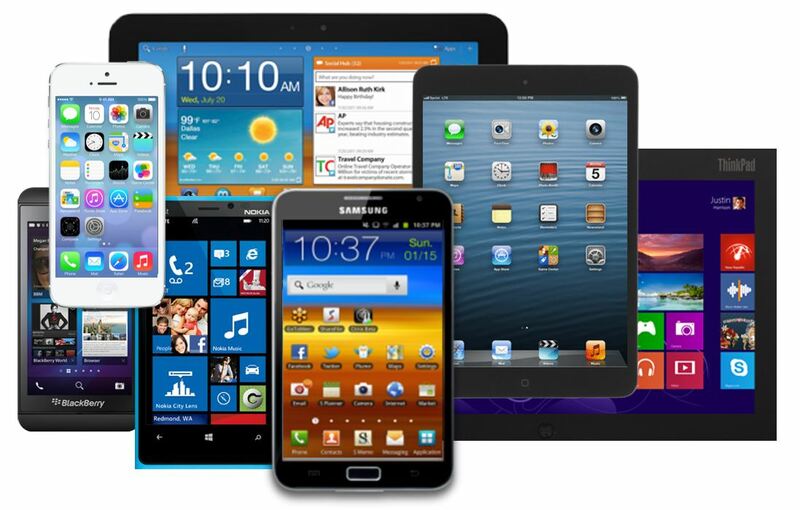 Most mobile dealers will be more than happy to help find the best devices for your organization and its needs. Make sure to choose only a couple of devices to support. Introducing mobile devices can be difficult for an organization. It is best if the tech department is involved and supports the devices - at the very least writing up a "suggested phones" list of devices that have been tested. In the past, we have worked with a lot of organizations that have faced a lot of frustration in picking the proper device for their environments. However, the past couple years with most devices maturing the needs of most are taken care with any device. For most organizations, the BYOD (bring your own device) movement is fully embraced. And this day and age most staff are now tech-savvy enough to support their own device. Over 70% of professional staff now BYOD and for organizations that will provide and require staff to use their devices, they have been unable to stop the use of staff owned devices. We have consulted that BYOD is an excellent way for organizations to save funds, and we feel that staff who can choose their own devices will use them more. Without a doubt any organization that still supplies a required phone will see their staff caring two phones (one personal and one professional - and guess which ones get used more). As always we recommend to have a policy with BYOD and a clear expatiation of what and how the device is to be use for work. We highly recommend to use the FirstClass mobile apps for mail. This will give you more features and connectivity with all the feautres of FirstClass. It will also make sure that all mail flows though FirstClass in a format that all staff can communicate with. It is also the only can you can guarantee that mail will be archived on the Archive Server. But, if you are required or need to use a standard mail client, then mail is retrieved via imap. On iPhone, Win Mobile/CE, Android device, Palm, and most other devices, SMTP will be used to send email messages. Port 587 'SMTP Submission' is suggested to send mail. A Blackberry device will only send email via the Blackberry messaging services (not the FC Server). A second option used to send email is the device's mobile browser. A user can use the device's web browser to log-in to the FC server for sending and retrieving messages. A third option (highly recommended option) is to use the FirstClass Mobile Client apps for the device. See below for a list of devices that have a FC Mobile Client app. It is important to point out that the FCSS is not required when sending messages (no syncing required). With each of these options, the device will connect directly to the FCIS. It is also important to point out that the server needs to be properly configured. I highly recommend the use the FirstClass mobile apps for mail/email over using any iMap client. It is by far a better FirstClass experience for communication on the server and it will help your organization be more compliant. If you are using the Archiving Server, using the FirstClass apps is the only way you can make sure all mail will be archived. For many of our clients, the FirstClass client is required due to this. iMap clients can be set up to bounce mail though other servers and not your FirstClass server. FirstClass Synchronization Services (FCSS) provides SyncML and ActiveSync connectivity to FirstClass systems. SyncML and Activesync are industry standard protocols supported by the majority of mobile devices and desktop applications. The FCSS is required to synchronize account data such as the personal calendar and contacts. The FCSS is not required for any FirstClass mobile client app connectivity (iPhone, Blackberry, or Android Mobile Client). It is only for syncing to a mobile device's proprietary calendar and contacts software to the FirstClass server. On the iPhone there is also the option to use the FirstClass Mobile Client app for calendaring. At this time, FCSS can run only on a Windows Server. Mac FirstClass servers require FCSS to run on a separate Windows machine. A Mac version of FCSS is in development. For more information on setting up FCSS, please contact us. FirstClass has support for mobile devices (phones, tablets, etc.) via web connectivity. Any mobile device with a web browser has full access to a FirstClass server. FirstClass supports both mobile and standard web browsers. The configuration of the FCIS as well as the template's version will affect what the mobile device will display. It is possible to configure a special sub-domain for loading only certain types of mobile templates. This web option on mobile devices is often overlooked - it is a great way for anyone to have access, in real-time, to their information and data. All calendars, conferences, and mail will be up-to-date and live. Many of our customers prefer this option as it gives them access to "everything" on their mobile device where some device apps have features that are left out. Both FCIS and FCWS can be access via mobile browsers. In much of our consulting and training sessions, we cover best practices and use for mobile devices. Mobility and productivity have simultaneously been thrust upon our daily routine; the mobile device has become part of our culture. This has impacted all of us in a positive way (and possibly in a negative way, too). We highly recommend that all organizations set some 'standards of use' and 'policy' in regard to mobile device use. We welcome any questions and look forward to scheduling meeting time to cover this new topic. The world is advancing quickly - invite us in to help keep up with best practices and use. •Email: view, create, reply to, forward, watch, check history, unsend, and delete personal and conference messages. •Voice mail: play voice messages encoded in MP3 format. •Contacts: create, view, and update your contacts and mail lists. •Calendars: create events and tasks, respond to invitations, combine calendars into one view, and create calendars. •Conferences: approve messages sent to conferences and create conferences. •Communities: view, create, comment on, watch, check history, approve, and delete community posts. Upload files to communities. Maintain communal wikis. Join and subscribe to communities. •Profile: maintain your profile and blog. •Drafts: save unfinished work as drafts. •File storage: upload files to your own personal file storage area. •Documents: create HTML documents in your own personal document storage area. •My People: maintain your personal buddy list. •Pulse: keep track of others' activity and comment on their status posts. •Chats: chat online with others. •Updates: monitor items you are watching for activity, check out invitations to communities, and maintain your list of community subscriptions, all right on your desktop. •Colored dots: see at a glance who is online and what is new. Keep your FirstClass content right at your fingertips, wherever you are. With FirstClass GO, you can use your Android device to access it all. Email - View, create, reply to, forward, watch, check history, un-send, and delete personal and conference messages. Voice Mail - Play voice messages. Contacts - Create, view, and update your contacts and mail lists. Calendars - Create events and tasks, respond to invitations, combine calendars into one view, and create new calendars. Conferences - View, create and respond to conference messages, upload files, etc. Now you can also change permissions, approve messages, and create new conferences. Communities - View, create, comment on, watch, check history, approve, and delete community posts. Upload files to communities. Maintain communal wikis. Join and subscribe to communities. Create communities. Profile/Blog - Maintain your profile and publish your own blog. Drafts - Save unfinished work as drafts. Upload files to your own personal file storage area. Create HTML documents in your own personal document storage area. My People - Maintain your personal buddy list, see their status, know when they are online. Pulse - Keep track of others' activity and comment on status posts. Chats - Chat online with others. Updates - Monitor items you are watching for changes, check out invitations to communities, and maintain your list of community subscriptions, all right on your home screen. Live Updates - Colored dots indicate at a glance who is online and what is new. NOTE* The FirstClass Android app requires that you have an active account on a FirstClass 11.0 or OpenText Social Workplace 2.0 based server with mobile access privileges enabled. The server has to be configured proper for mobile connectivity. If you are having connecting errors, contact your server administrator and make sure the server is set up proper. Create events and tasks, respond to invitations, combine calendars into one view, and create new calendars. File storage - Upload files to your own personal file storage area. Documents - Create HTML documents in your own personal document storage area. The FirstClass server must be updated to v11 to support this app. OpenText worked with RIM to build a BES mail module for FirstClass which is bringing native FirstClass email, calendaring and contacts to the Blackberry. To download the Blackberry client, visit the server login page via the Blackberry mobile web browser. There you should be able to find a link to download the client directly on the device. FirstClass is a registered trademark of Open Text inc. All other trademarks are the property of their respective owners. Currently this website is being updated and will be pushed over to the new FirstClass 12 Web Services. For the next couple months our new websites will be under development as we run real world tests of the new FirstClass API. We do apologize for anything that does not line up.